The Post reporter mentions Jean Young, “an amateur geologist in northern Iowa,” who first noticed the fossil-rich shale that now fills the crater. It says Young spotted it about a dozen years ago while inspecting gravel well drillers pulled up. Young, however, wasn’t exactly an amateur. A quick search reveals an online biography posted with a photo of her art, on display at Decorah’s Luther College. Although she had worked for the Postal Service, Young had a master’s in geology from the University of Iowa, taught courses at Luther and was curator of the college’s geology collection beginning in 1990. More than just poking around with rocks, as the Post description might suggest, Young collaborated with Iowa Geological & Water Survey scientists. The survey’s post on the shale formation she helped find includes a bibliography of scholarly papers and presentations, each listing her as an author. What I like about this story is how an academic took an active interest in her home territory, rather than researching some feature or people in a distant land. And I like that a state agency, the Department of Natural Resources’ Iowa Geological & Water Survey, played an active role. Your tax dollars at work, in a good way. That’s also what makes me think this isn’t big news to Iowans in the Decorah area. Robert McKay, a research geologist with the agency who’s quote in the Post story, delivered a lecture on the crater research more than a year ago. Update, March 5, 2013: The Des Moines Register’s Perry Beeman reports that high-tech flyovers have confirmed the crater’s presence. Perry has some good details, including the crater’s impact (pun intended) on where folks in the area can drill for water. 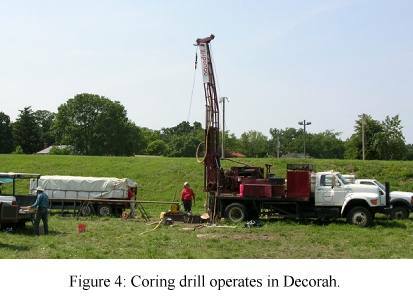 But my guess is they already figured out where the drilling’s good, since Decorah has been around for more than 150 years.